Ok so Mother's Day is almost one week away, and at this point you might be thinking what can I get for my mom, stepmom, or any other mother figure you may have in your life. Over the next few days I am going to share some great gift ideas for moms with you and today we are starting off with some perfect ideas for the mom who loves whimsical, all natural beauty and skincare products. 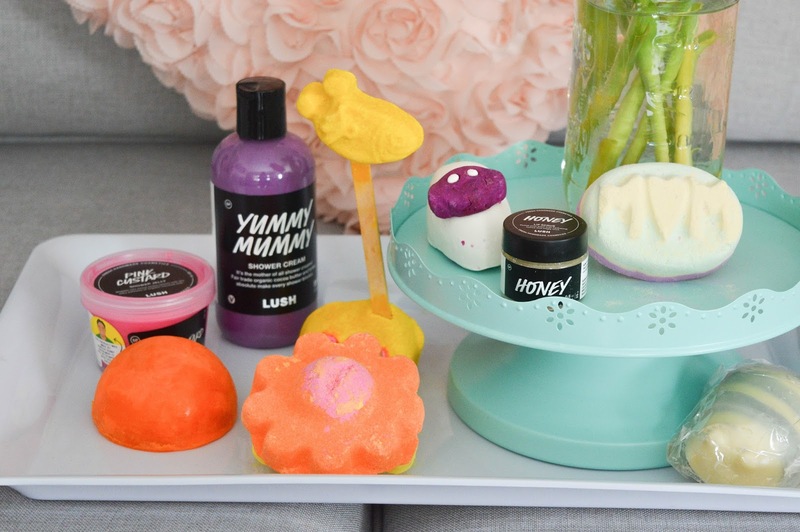 I shared my love for the Lush brand a few weeks ago and today let's chat about their Mother's Day collection. 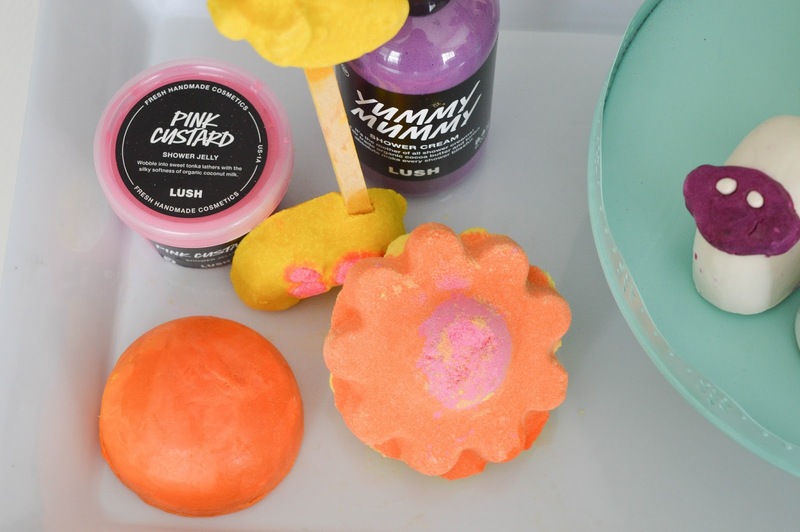 From bright bath bombs, to delicious smelling shower products, if you have a mom who enjoys a little bit of the whimsical side in her gifts then these are the perfect options. Lush's Yummy Mummy shower cream is a sweet strawberry scented cream that you can use in the shower. Made with fair trade organic cocoa butter your mom will know that she is getting the best all natural products. The Pink Custard shower jelly is probably the most perfect shade of pink. This is used like a body wash and smells like vanilla berries. Ok so what is this large round orange mound you are seeing in the above picture? Well it's the sunrise soap, and it smells like fresh orange juice. Citrus soaps have to be one of my favourite smells and the sunrise soap does not disappoint. This cute little sheep is a actually a bubble bar, put it under some running warm water and your tub will fill with bubbles. OK so I may not take baths all that often, BUT my son Charlie LOVED this bar. He was in his own version of bubble bath paradise. 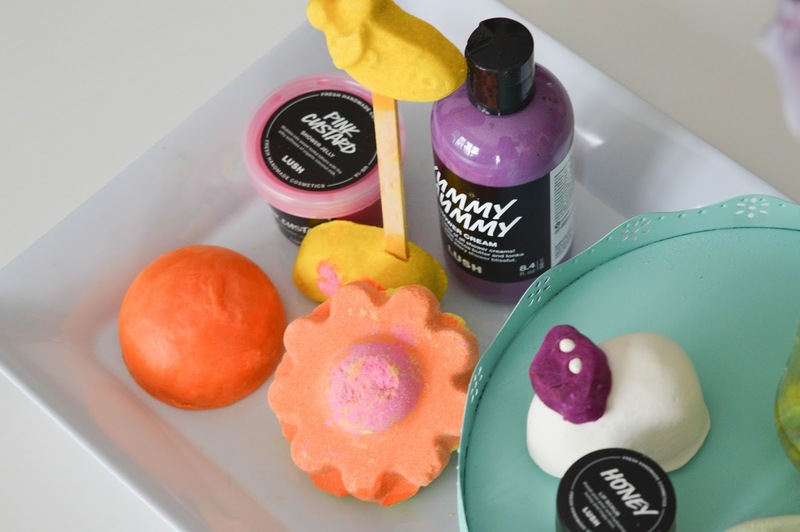 The Ups-a-Daisy bath bomb, Elsie the Giraffe, and the "MOM" bath bombs are fantastic gift add-ons that I know we all look for. These are like the icing on the gift cake, and will make any mom want to have a bath. 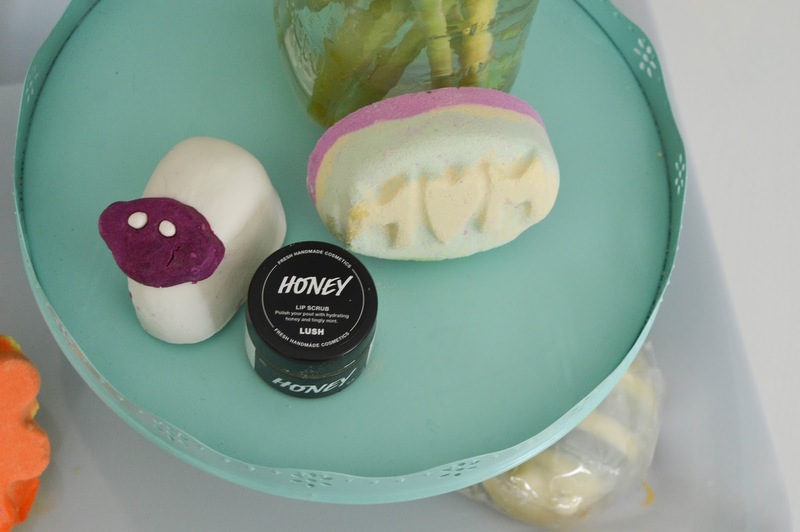 My two favourites in the Mother's Day collection are the Honey lip scrub, and the Scrubee body butter bar. The Honey lip scrub, is a lip exfoliator that leaves the lips feeling velvety smooth. This product is fantastic because you don't need a lot, just a small amount goes a long way. You place a small amount of honey scrub on the middle of your lips and scrub along the lips to the outer corners. You can then eat the product (YEP you can! ), or wash the excess away. The little Scrubee body butter bar is at the very far right in the above picture. It looks like a little bumble bee. This body butter bar has ground almonds and coconut shells to exfoliant the skin. Surrounded by the stripes of coconut shells and almonds is softening honey and shea buttter, to moisturize and exfoliant at the same time. There is still lots of time to order online through the Lush site or pop into your local Lush location for these great gift ideas and more.